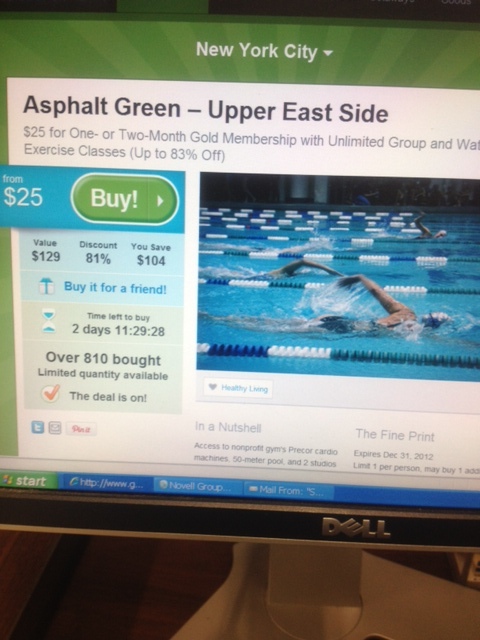 Amazing Groupon Deal – Asphalt Green – $25 for One Month! I am a fan of Groupon. Every now and again, there’s a great deal. One of my favorites was a family membership that I purchased at the Brooklyn Museum a few years ago for $40. Well, right now there’s a Groupon deal of that amazing caliber: Asphalt Green. Limit 1 per person, may buy 1 additional as a gift. Must activate within 2 months from the purchase date, membership expires 1 or 2 months from activation date. Valid only for option purchased. New clients only. Must be 17 or older. Must sign waiver. ID is required at registration.